IT WAS THE MORNING OF THE FIRST DAY OF HER SCHOOL, AND MILK WAS FEELING A BIT SCARED. "DON'T WORRY," SAID DAD. "YOU'RE LA CREME DE LA CREME--THE BEST OF THE BEST!" So with a sparkly new backpack and a jaunty polka-dot bow, Milk is feeling fresh and filled with goodness as she arrives at her school, ready to make friends. "I LIKE YOUR BACKPACK!" SAID CUPCAKE. "THANK YOU!" SAID MILK. "MY DAD SAYS I'M THE CREME DE LA CREME!" "I THINK THIS MILK IS SPOILED." Milk's merry mood curdles a bit. First impressions are important, and now perhaps her efforts to upgrade herself have dampened her attempts to be nice. Still, she tries to make friends, asking Cupcake to sit by her and offering to share her crayons with Carrot. "I DON'T CARROT ALL!" CARROT REPLIED. "LETTUCE ALL BE FRIENDS." But Waffle is on a roll by now, trying to turn everything Milk says and does into evidence of being spoiled. Milk says she'd like to be Queen when she grows up, she tries to impress everyone by getting Grade A on the spelling test, and berates Soup for splattering her paper. Name-calling follows. "SPOILED!" SAYS WAFFLE AT EVERY TURN. Things have certainly gone "off" in her classroom. Milk is beginning to sour on this whole school thing and is sure nobody will ever be sweet to her again. And then she slips on Banana's peel and spills herself all over the floor. "QUICK! SOMEONE BRING IN THE KITTENS!" QUIPS EGG. Beans suggests jumping up and down in the spilled Milk and making milk shakes. Waffle suggests cottage cheese. But Mrs. Pear steps in and the kids are reminded that Milk has tried to be nice sometimes, and they all stir themselves to return most of her to her carton. All the class find themselves a bit soggy. Will Milk be really steamed? Is the first day of school spoiled for everyone? 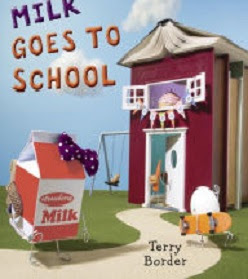 In Terry Border's tongue-in-cheek latest in her comestibles series, Milk Goes to School (Philomel Books, 2016), all ends with a laugh as Milk points out that, thanks to her, everyone is now a little la creme de la creme, too. Savvy second or third-grade readers will find the punny food quips comically cheesy, while young kids will be amused by Border's anthropomorphic groceries with bent wire arms and legs, seated at desks and doing Kindergarten activities. Fans of Border's sweet 'n' silly foodie stories, Peanut Butter and Cupcake and Happy Birthday, Cupcake! will likely eat this one up.